Vice-President Cathy Symonds and the Looking Glass Playhouse Vice-President Brad Sanker. 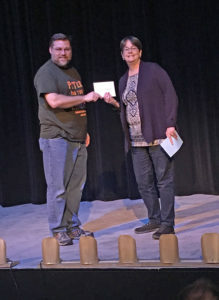 LEBANON – In support of the Lebanon Women’s Club’s goal of returning all funds raised back to the community, Vice-President Cathy Symonds recently presented donations to the Lebanon Food Pantry Chairperson, Donna Weil, and to the Looking Glass Playhouse Vice-President Brad Sanker. On February 28, President Abby Murphy also presented a donation to Chapter One president Jessica Zurliene in support of their back-to-school backpack initiative. 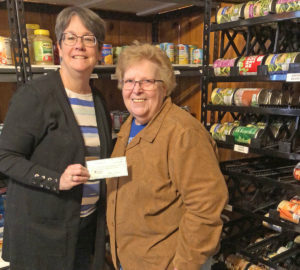 Vice-President Cathy Symonds and the Lebanon Food Pantry Chairperson, Donna Weil.